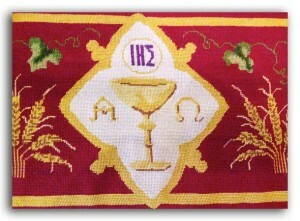 The communion rail needlepoint kneelers were designed and created by women of the church. The work was done on 14 count canvas with Paternayan wool in the diagonal tent stitch, which is often called the basket weave stitch. Mr. Leo Kutner, who worked on many of the kneelers in the Washington Cathedral, upholstered all of our kneelers. Many of the ideas for the kneeler designs were taken from the sanctuary. The designs on the seven original large kneelers symbolize Baptism, Confirmation, Marriage, Communion, Ordination, Penance, and Unction. The Altar Guild members urge you to view the kneelers and will be glad to answer any of your questions.